The newly-improved Continental rubber compound in the outsole is designed to enhance an already very good traction. 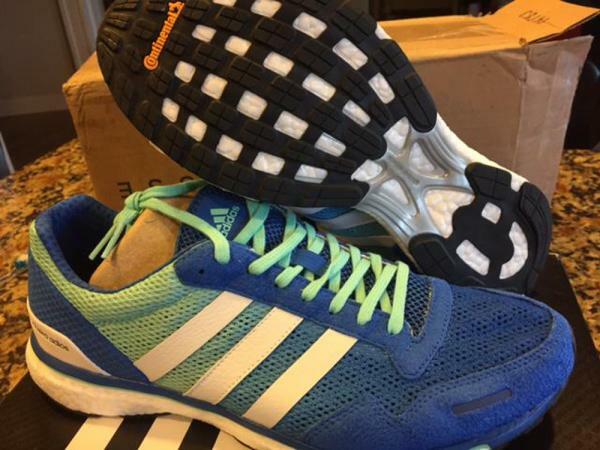 The Adios Boost 3.0 has a snug upper that adapts very well to the movement of runners. 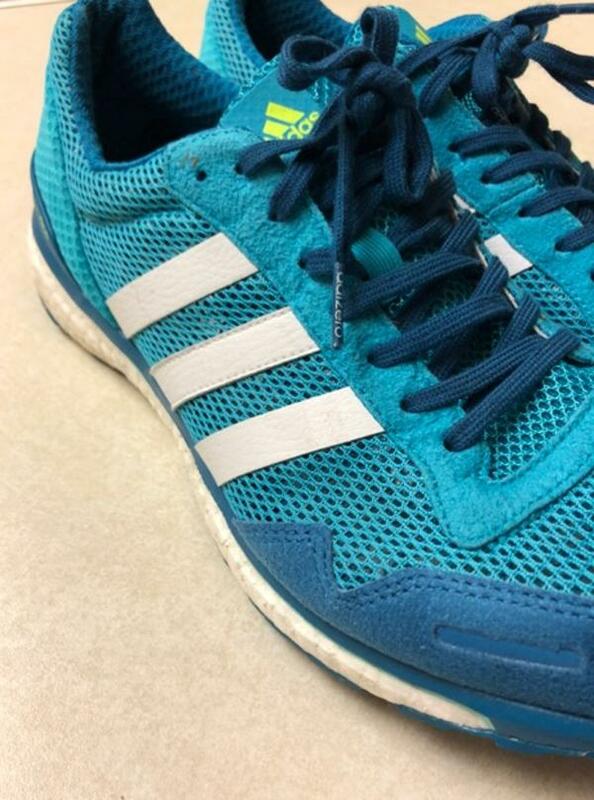 Some runners noticed that Adidas used better quality materials in the Adizero Adios Boost 3.0. A small number of testers loved the responsive cushioning of the Boost midsole. Comments about the tons of comfort that this shoe provides are common among numerous reviews. Designed for marathons and long-distance running, a few testers consider the Adidas Adios Boost 3.0 as good enough even for shorter runs like 5Ks. It looks very cool and stylish, especially since it has 4 color combinations. The gait cycle is effortless and smooth based on the reviews of several testers. Several runners noted that the fit is a bit too narrow. Some parts of the upper have caused blisters or hot spots in the foot of a couple of runners. The Adidas Adizero Adios Boost 3 combines the toughness of an everyday trainer and the nimbleness of a racing shoe. It gained mixed reviews from users, but the positive experience overshadowed the minimal negative comments. With sufficient arch support, responsive cushioning, and insane comfort, running all types of distances are a breeze with this shoe. I was looking for a racing flat for my first marathon, the 2017 Chicago marathon, and had liked a Adidas Adizero Adios Boost 3.0 a try. They couldn’t have worked out much better for the race. They felt great throughout the race. I didn’t notice any hot spots or ever feel like there wasn’t enough shoe for support. In the lead up to race day, I tried a few other flats that left my legs feeling overworked. Not enough structure behind them. Adidas has a perfect blend of just enough structure while still being lightweight and responsive. On the day I was hoping to run a little faster, but it wasn’t the fault of the shoe! Previously, my go to flat was the Nike Streak. The Adidas Adios seems more aggressive and has a more substantial support for longer distances. Mainly, the Streak left the bottom of my foot sore often times when used for longer runs and workouts. This was not a problem with the Adios Boost 3.0. Out of the box, the shoe was comfortable and light. The upper has a responsive feel than some of the more expensive flats. It replicates a sock-like feel. I really like the secure fit this provides. When running fast, I prefer to not have the feeling like I am running in socks and that your foot has TOO much freedom to move around within the shoe. Another important note is that I didn’t have any issues with the laces/tongue digging into my upper foot and creating pain points or blisters which is imperative. The boost technology is amazing! The sole is lightweight and comfortable while not being overly bulky. The sole offers a substantial cushion for a racing flat without feeling heavy. I could wear this flat as an uptempo trainer, and likely will from here on out. They are perfect in terms of cushioning and weight for a half marathon to the marathon race. Even after a full marathon, I didn’t have any foot discomfort that is often present with racing flats with very little cushioning. The Adidas Adizero Adios 3.0 has the Goodyear traction placed on the bottom of the shoe. A lot of flats give the feeling that you may slip if even one raindrop hits the pavement. You might even slip on your own sweat.... not with the Adios. They are unlike any other running shoe I’ve tried in this aspect! You really feel connected to the ground. When running at faster speeds this is very reassuring. Making 90 degree turns in a race is also easily navigated due to the extra sense of traction provided. When you put on the Adizero Adios Boost 3.0 on you feel fast. From the support they offer, the unbelievable traction, to the lightweight cushion, they are a near perfect marathon flat. Very responsive and light combination. The upper allows your foot to feet secure without creating hot spots or pain points due to too much restriction. A secure foot in the shoe has always made me feel faster and more confident in a workout or on race day. There must be a reason that a good number of the top marathoners in the world wear these shoes! You put them on and just feel faster and they offer enough cushioning to get your legs through a marathon. These will be my go-to racing flat until the next version (maybe)! I needed a new road shoe for training and marathon racing. I like to train in light trainers and often use them for my marathons. I have been wearing the Nike Lunar Racer shoes for the past couple of seasons however when Adidas Adizero Adios Boost 3.0. I wear a 10 and the shoe fits true to size. The arch support is firm and fits a medium height arch very well. The toe box is what I would consider an average toe box. There's enough room to wiggle the toes but not too much that your foot slips around and not so tight that you get numbness. This caused me some initial pain in my arches and blisters on my forefoot due to slipping. The laces are the flat type of laces and offer a nice tight pull without slipping. I never had these shoes come loose while running. If you notice the laces are close together, this causes issues with getting the shoe off. Every time I put the shoe on or take it off I have to loosen the laces more than I do with other shoes. If you’re like me and have to have your shoes laced to fit you for every run this causes me concerns with having to get the tension correct for every run. The shoe specifications say it has a 9mm heel drop, neutral trainer, weighing 246gms/8.7Oz in size 9. My size 10’s only weighed 220 grams or 7.7oz. You can see the very open mesh upper. It breathes extremely well but doesn’t keep any of the environment out if you need a shoe that keeps the weather out. The synthetic/mesh upper breathed very well & my feet were always comfortable. The forefoot of the shoe is very stiff; I really didn’t like these shoes until I got over 100 miles on them when they are finally broken in enough to be comfortable. The traction is very good on this shoe and the soles wore extremely well. The shoe has no motion control and thus it feels like it doesn’t have any. I am a neutral runner with a very slight overpronation, so I had no issues with the lack of support. This shoe doesn’t do well on trails nor was it designed to. I felt the shoe was a bit slow on the track and I didn’t feel that there was any boost. At marathon distances there isn’t enough cushion, you will feel the miles. I have logged over 500 miles in these shoes and they show it. The tread didn’t hold up as well as I'm used to Continental rubber holding up. The support and upper wore very well and I felt that I could get more miles out of the shoe had the outer sole held up better. It took me a while to get used to the road trainer. These aren’t super light and don’t have a fast or cushioned ride. 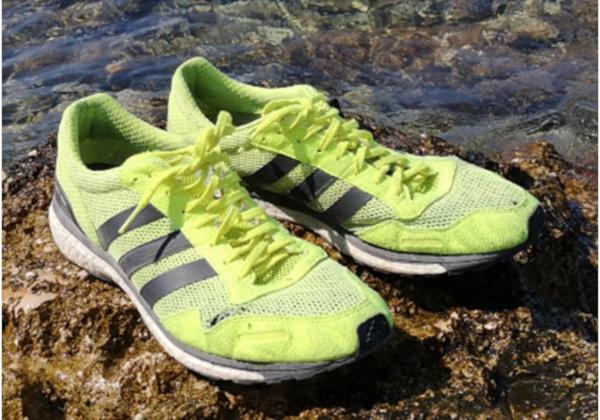 Until I bought a pair of Adios 3.0, I was a one shoe fits all kind of runner. Adidas Adizero Adios is a neutral shoe; they are very light with thin cushioning, designed for road running and racing up to marathon distance. 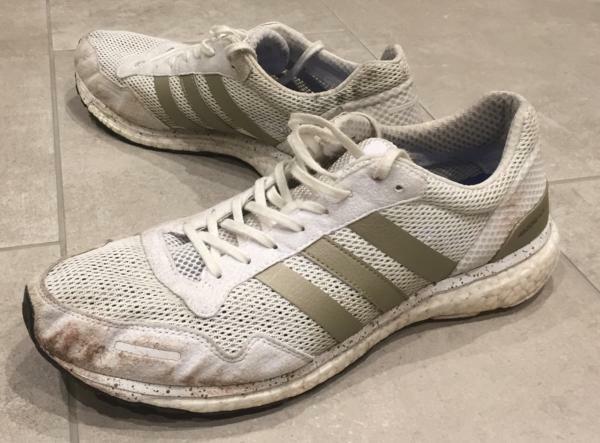 As my experience has grown as a member of a couple of running clubs, I noticed a trend among the faster runners that a pair of Adidas Adizero of some sort seemed to be a consistent presence in their trainer garages. I read up on the different models and tried them on in various shops before eventually settling on the size 11 Adios 3.0. I was hoping they would be a nice light, comfy shoe for running, and I hadn’t considered how much more than that they might be. Buying running shoes can be stressful because of the potential impact they can have. The right pair can help make you a faster, better runner while the wrong pair can increase your chance of injury, more because of incompatibility rather than bad design. I initially tried on sizes 10 and 10.5 of the Adios and Boston boost trainers and found both too tight for my forefoot. Despondent, I began considering alternative options assuming the shoe design was just too narrow and larger sizes would be too long. Eventually, I returned and tried a size 11 which I thought would be way too big but was the right size for me. So if you consider these shoes, be sure to try quite a range of sizes, you might be surprised what actually fits, and other Adidas models aren’t necessarily a good guide! I began using these as my primary running shoes, around 3-4 times a week usually including a Saturday track session. First off, as my first pair of Adidas Boost, I didn’t notice a discernible ‘boost’ maybe a slight spring (that’s not to say it doesn’t provide any) more likely that I’m insensitive to such things. The minimalist cushioning provides a nice level of comfort, but you are very aware of the shoe lightweight nature which when used for faster-paced track work provides feedback to an extent I’ve never felt before. This was the game changer for me with these shoes, I more readily felt how my feet were landing and how my legs moved more mechanically through my stride, where previous trainers with greater cushioning numbed me to these inputs. I had been improving steadily before I bought these shoes through excellent training sessions at the club. I feel the shoes help me improve my performance as I was setting PR’s on Strava for routes I regularly ran. As the title suggests, I love these trainers, but there are two negatives in my eyes. One is the sizing because I usually I'm roughly a size 10, but as explained above, I need an 11 in these. The second and more prominent issue is the Shoes’ durability. I have run just over 100 miles and have circled in the image above where some of the tread pads have worn off. I’m certainly not easy going on shoes, but I only weigh 74 kg, and the wear seems disproportionately high. The Adios did change running for me. I fully recognize this may be purely the flat racing concept, but these were my first foray into such a style. They are very light yet comfortable enough to do a half marathon and probably a full easily. I’m confident they alone have made me a little faster, but also helped me consider my running form more, which in turn helped improve my technique. Getting the right size is a pain, and they seem to wear out quite quickly which is disappointing, but I will buy another pair when they do because they work that well for me. The Adizero Adios is one of the flagships of marathon running shoes from Adidas which is already going into its 4th generation. It is proven to be fast in many marathons and used by elite athletes all over the globe like Dennis Kimetto when setting a new world record at the Berlin marathon back in 2014. From my point of view, Adidas did a great job in terms of marketing by introducing many several colorways over the time of the Adios 3 instead of changing the shoe itself. One major feature is the Boost foam which shall provide one of the best energy return levels on the market. Compared to Adidas Sub 2 (which also has Boost) it is softer and therefore targeting also hobby athletes who are searching fast race shoes. The weight is (248 grams at size US 12) which is not as light as compared to other racing shoes, but nevertheless, they feel great and not heavy even at fast paces. In short, I used them for every type of training session or competitions (5km up to M) beside trail running. They feel very good in every pace, from 3:00 min/km intervals up to 6:00 min/km recovery runs. These shoes are real allrounders. Of course, on road, they feel best but also on the track the cushioning is fine and not too soft. Forest or gravel paths are also no problem if the underground is not too rough. As typical for Adidas, Adios also run out small. This means you need to purchase them a half size or even one size up compared to other shoes like Nike (at least that's the case for me). The toe box is quite small which is fine during running but unfortunately quite uncomfortable when just walking around with them. Of course, the main purpose is to run with them, but when moving around before or after a competition, they could be more comfortable. According to the latest reviews of the new Adios 4 variant, Adidas seem to have this issue addressed in this generation. The boost foam definitely does his job. The touch on the ground feels good, direct, and running is overall smooth. In terms of energy return, the cushioning performs very well when comparing it to other foams from competitors. I also really like the Boost cushioning in other Adidas models like the Agravic, Boston or Tempo. With 1270 km (to be precise) they are the shoes which remained for the longest period of time in my shoe rack. Even the cushioning still feels great after this distance, and I would have continued using them but the upper ripped off at the toe box area. The grip itself, provided by the sole developed in cooperation with the tire company Continental, is still reliable in curves and wet conditions. As you can see on the picture, the outer sole also looks okay. Definitely, these are shoes where you can set some new PRs (at least I did). I purchased myself a second pair of the Adios 3 which is now at 400 km, and I don't regret it. As a pro athlete, you might have another option by choosing the Adizero Sub2 to spare the last grams of weight. But as mentioned above, you have to deal with harder cushioning. The 3rd version of the Adidas Adizero Adios Boost is a lightweight running shoe that’s meant to function well in distances that range from 5K up to the marathon. The responsiveness of its individual components allow it to set the runner up for a more efficient and natural stride that’s not bogged down by a heavyweight or an uncomfortable structure. The upper unit shoe uses materials and technologies that ensure the runner stays cool and dry at all times. When combined, these fabrics encourage air to constantly enter the shoe, rendering the interior environment free from odor-causing moisture. A memory foam in the heel collar ensures that the foot stays in place. The mid-sole unit features a foam technology that uses a compaction of TPU pellets to make a responsive and comfortable platform. It is one of the most durable foams around, so runners truly get high quality performance, even after many uses. Two outsole technologies cover the external sole unit of the Adidas Adizero Adios Boost 3.0. One of them offers durable protection against landing impact, aside from its anti-abrasion capability. The other component gives the runner effective traction over dry and wet surfaces. The Adidas Adizero Adios Boost 3.0 has a standard running shoe length. It comes in sizes that follow the regular measurements for men and women. The available width is medium, so it accommodates the runner who has a medium sized foot. Its semi-curved shape allows the natural curvature of the human foot to acclimate well to it. Continental™ Rubber is one of the most durable and effective outsole technologies on the market. Originally used for racing tires, this rubber material gives the runner great control over the surfaces, and even surface conditions such as wet or slippery roads. It runs from the mid-foot to the forefoot section. The ADIWEAR™ is a proprietary outsole rubber that’s placed in the heel area. Aside from delivering traction and durable protection against abrasion, it is also able to provide shielding from the impact forces when landing the foot on the ground. The boost™ foam technology is a lightweight mid-sole unit that’s made from thermoplastic polyurethane pellets that have been formed together to make a comfortable layer that protects the foot from impact. It is responsive and it doesn’t limit the movements of the wearer. This material is also seen in the Ultra Boost Uncaged. The Torsion® System is a thermoplastic unit in the mid-foot area that serves as a means to maintain the structure of the sole unit. It also gives increased stability because it helps the foot to go through the gait cycle with ease. Open Mesh is the main fabric used in the Adidas Adizero Adios Boost 3.0. Its open construction allows the foot to be well-ventilated as air constantly enters the shoe. It’s also soft and responsive, and it doesn’t limit the flexibility of the foot. The Coolever Mesh Lining gives the runner dependable moisture control. It’s a smooth material that’s easy on the skin, therefore allowing the wearer to use the shoe even without socks. The Geofit construction with memory foam in the heel collar improves the fit by conforming directly to the natural shape of the wearer’s foot. It keeps the foot in and prevents accidental slips.